A farewell breakfast greets you this morning. The final day of your tour is where we endeavor to ensure it is not easy to leave us without leaving a piece of your heart in New Zealand. The Hokianga Harbour Gifting Farewell from the locals is very moving as we depart to KeriKeri Airport via Kaikohe returning you to Auckland by Air. Our travel concierges will be there to greet you to ensure your private transfer to your Auckland Hotel accommodation or to your Flight Departure Lounge if you are continuing your travels that day. We know your time with us will be memorable but more importantly we hope that part of yourself is left here in New Zealand. 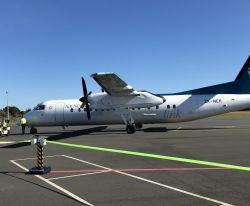 As you journey back to Auckland with Air New Zealand from KeriKeri Airport you will experience outstanding service from this top Airline in the World! Our Travel concierges and private transfer chauffeurs will be there to meet you after you land and will take you to your hotel lobby in Auckland or the international airport depending on your future travel arrangements. As you reflect on this unique vacation of a lifetime you truly have had a Taste of New Zealand. You would have now experienced our biggest city Auckland, country living in the North, food and wine from different regions, wildlife interaction in their natural habitat, had the opportunity to enjoy excursions in, on, above and under our waters, explored our land, beaches and coastal paradises, inner harbors and volcanic islands. From our day skies you have seen the sun rise first and had aerial views of the Northland and southern hemisphere night stars and Kiwi hospitality. Educated now with our history, the arts, spirituality and the Maori culture, Kiwiana, Kiwi pride in what is native only to New Zealand, we are excited that you traveled all that way to meet us. For sure you have met the true gregarious Kiwi! We farewell you and hope to see you return to the land DownOver.